Achieve custom men's style with a patterned sportcoat. 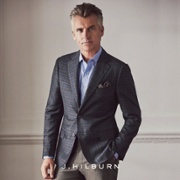 Whether you are on duty or off-duty, reach for custom men’s style with a patterned sportcoat. So, let’s talk about the patterned sportcoat because even though blues and grays are classic, today’s guy needs to mix it up from time to time and the patterned sportcoat is a great way to maximize your wardrobe with a single piece. Here are three ways to work the patterned sportcoat. This is a great way to play up your favorite colors or designs without committing to a full suit that might be too bold for your taste. A pattern coat can be work over a custom button down or custom polo. Here we still have a nice blue pattern, a perfect way to transition from a solid. But also note the brown check patter on the right. Brown has really made a comeback this year and I don’t think it is going away anytime soon. Great color for the Fall! Paired with a solid trouser, the patterned sportcoat gives a powerful and executive look as it exudes confidence in your personal style. This look tells the world that you mean business. Is denim your go-to even for the office? Perfect. A sportcoat can dress up a pair of jeans any day of the week whether you are on or off duty. Seriously, if jeans are OK at your office, wear this and thank me later. Thanks for stopping by and as your personal stylist, I come to you. Questions? Ask away in a comment or book an appointment here.